How to connect your Windows 8 desktop to my HD TV? Most of the people are searching the same question on the net and can’t find the easy way to connect both devices. These day most of the Laptops, Desktop and HD TV has the display port feature which you will use to connect your windows to your television. To use this feature you don’t need any application, all you need a HDMI or VGA cable to connect both the devices. After that you can extend your windows 8 desktop display and use use your windows 8 as dual-screen. Today in this post, i let you know how to connect a second monitor to your Windows 8 machine and how to manually switch the displays. Once both the device connected you can enjoy all your movies, Video, Images, and your work on your HD TV. To follow this guide you need need an HDMI or VGA cable and Windows Desktop with HDMI and VGA ports. After that you have to make some changes on your desktop and you are ready to go. The process is so simile and takes five to ten minutes to connect your TV and Desktop. Get ready with your HDMI or VGA cable and find the HDMI and VGA port on your desktop and your Television. These days all the HD television comes with the HDMI port and you can find the same easily on your television. With HDMI port you will connect most of your other devices to your television like PS3, XBOX, Blu ray disc player or any other DVD player. Once the cable are attached with both of your TV and PC. Go to your Windows 8 Desktop to make some changes on your display setting to connect your TV. Right on the desktop and you will see the option “Screen Resolution”. 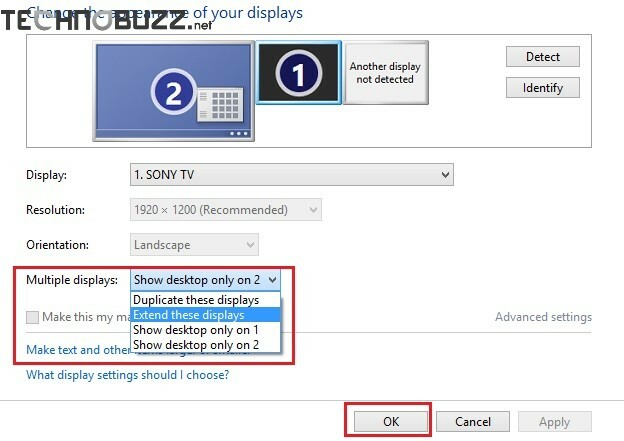 On the screen resolution page you will see that both your devices TV and Desktop names are listed on “Display” option. That means both of your device are connected successfully and you are ready to use them as your extended or duplicate display. If your TV name is not in the display option then use the Detect option from the Screen resolution screen. Now from the “Multiple Display” option select “Extend” or “Duplicate” to connect your Windows 8 desktop with your television. With Extend Feature you will extend the display of your Windows 8 screen and with the Duplicate you will create the duplicate screen of your Windows 8 desktop on your TV. That’s it, now your Windows 8 is connected with your TV and now you can enjoy your television screen as your second windows screen. If you are looking for more other ways to connect your TV with your PC then do check our guide 5 Ways To Connect a Laptop Computer to TV (Television Screen).